As the seasons changed from autumn to winter, I found myself reflecting on the transitions I’ve gone through this year. Throughout last winter, spring and summer, I stood in the emotional intersection of enthusiasm, uncertainty and fear. After working for the same company five years, I felt stuck, like I was not making progress. I realized I was only in this position because I was comfortable. I graduated college with a bachelor’s in social work in the fall of 2017, and with the excitement of finally crossing that hurdle came uncertainty. Now what? What does life after college look like? Should I attend graduate school? Do I start a job in my field? I knew I was not ready to go to graduate school, I needed a break from the institution of higher learning. I began applying for jobs and a couple of fellowship programs, even though I didn’t quite know the difference. I was offered a position in my hometown and one in Jackson, Miss., I had another tough decision to make. 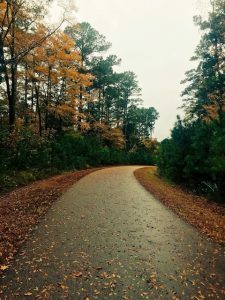 Do I stay comfortable, or do I uproot myself from Georgia soil and move away from my family? My mom told me jobs are hard to come by, and when offered one, I should accept it and stick with it. On the other hand, a fellowship seemed inconceivable and out of reach. I had built myself a box in which I was comfortable, and it included all my familiarities: family, job and community; it was difficult to step outside of that box. Change can be uncomfortable, but accepting a fellowship felt necessary for progression and evolution. For the first time, I chose myself. Guilt still lingers whenever I get updates about what’s happening at home. Texts that say, “I wish you were here” … “If you were here these things would run better” … “Things are not the same without you here” all frustrate me to the point that I struggle to enjoy the opportunity to develop personally and professionally, cultivate new relationships and settle into the peace of this fellowship. Through it all, I am transforming my guilt into gratitude that allows me to grow in the ways I hoped I would five months ago when I packed up my little red Jeep and said goodbye to home. In the spirit of gratitude, I am thankful for the opportunity to be a part of the inaugural Ladner fellowship here at The Lighthouse | Black Girl Projects. I began in August, and since then, I’ve had plenty of challenges and setbacks during my transition to Jackson. Gratitude, however, allowed me to refocus from what I lacked during those challenges to the abundance that was in front of me. I appreciate the opportunity to work with a fantastic organization and with a great team of people. Gratefulness flows from my heart like an autumn breeze. I take inventory in this beautiful moment and cultivate the greater appreciation that is around me. There is no doubt I made the right decision. I’m thankful.